Seven Bridgstreet, Galway's Latin Quarter. Stylish Cocktail Bar. Seven Bridgestreet in the Latin Quarter is the perfect location for incredible cocktails, tempting food and quality entertainment, 7 nights a week. Seven Bridgestreet prides itself on being on-trend and is a hub for artists, musicians, locals and visitors alike. Located in the heart of Galway city, we are renowned for our live entertainment – selecting the best live bands 7 nights a week along with a Resident DJ & Late Bar every Friday and Saturday night, ensuring you are always entertained. 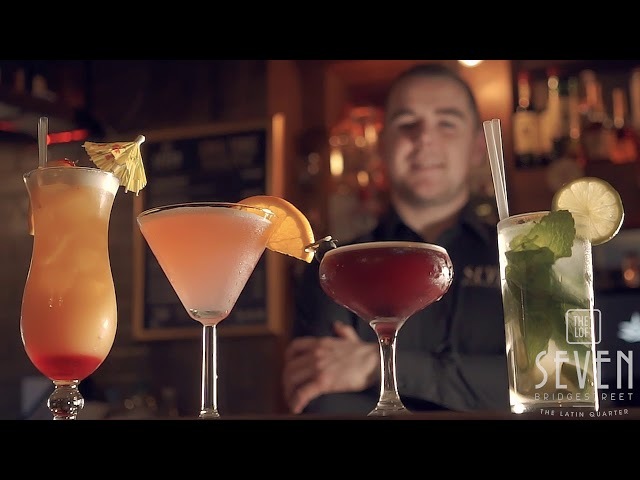 Call into us and sample something from our enticing beverage menu which includes cocktails, gins and whiskies, all served with a smile by the friendliest staff in Galway. If you are looking for an appetizing menu offering everything from delicious nachos, to tasty burgers, to mouth-watering desserts, then there’s every reason to get down and indulge in all that Seven Bridgestreet have to offer. staff. A huge thanks to Dwayne and all the staff! View our upcoming events, book a party or buy tickets to any event. Seven Bridgestreet are renowned for their delicious cocktails. View our menu here. Seven Bridgestreet are renowned for their delicious food. View our menu here. Click here to view our gallery of our venue, nights out, cocktails, food, videos and more. Join our Loyalty Club and receive exclusive offers and updates from Seven Bridgestreet.